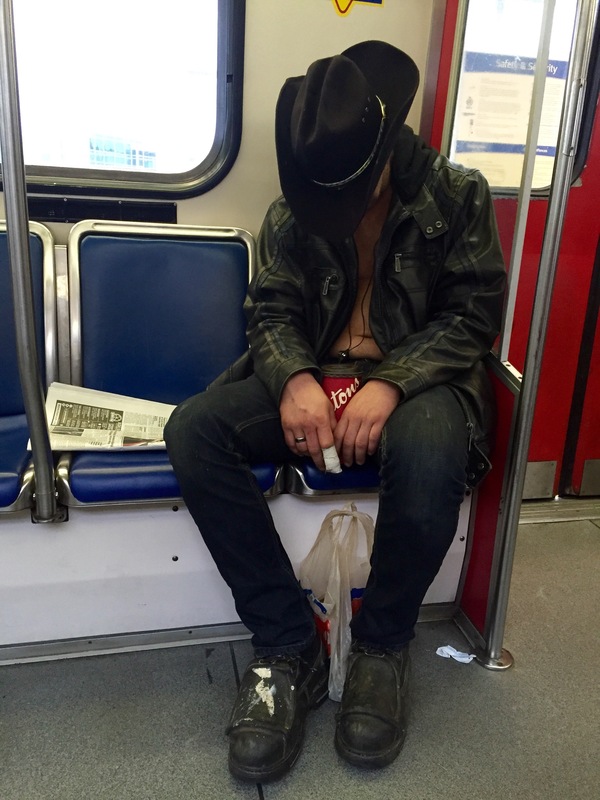 It may or may not have been a good night for this particular morning commuter, who either partied his shirt off or lost it, when he pried himself from a ‘trap’ upon waking. Still, he manages to pull off the Slash-look, easily, even in spite of his state of consciousness. The jungle apparently brought him to his kn-n-n-n-nees. To the young, able-bodied man who snuck his way into the last seat on the train and then promptly stared at his phone, while a pregnant woman stood in front of him – may you trip upon disembarking, on your undone shoelace, sending your iPhone 6 Plus sailing into the air, landing squarely on the track, where it is then promptly run over by the next train – your iPhone, that is . . .
May you have a smooth ride, if you must apply your eyebrows on your morning commute, so you don’t look mad … or surprised, maybe … all day. A large cat was seen taking public transit in Vancouver today, but unlike its similarly-sized cousins – lions and tigers, the animal appeared to be domesticated. The nearly six-feet-tall feline, who also sported a mustache and strawberry-red hair on his head, was reading the newspaper and walking upright.